ACTIVATED CARBON is an industrial chemical used for air and water filtration and purification which is produced by the activation of coconut shell charcoal, wood, fruit kernels or sawdust. Activation is the process of removing hydrocarbons adhering to the carbon material by means of chemical or thermal treatment This is usually done in a rotary kiln, where the charcoal is heated to a temperature of 800-1000oC in an atmosphere of superheated steam. The reaction between the steam and charcoal takes place at the internal surface, allowing the breakdown and removal of hydrocarbons, thus producing a highly developed network of tunnels and pores that are ideal sites for ADSORPTION. Under a scanning electron microscope the pores appear like a porous bath sponge. One gram of activated carbon is said to have the surface area of a 1,200 square meters- a large as a football field! It is this vast internal surface that gives activated carbon its unique ability to adsorb a wide range of compounds from both the gas and liquid phases. Once the targeted compound is in contact with the activated carbon, it diffuses into its pores and is locked in place by weak Van de Waals forces. The process of transferring molecules from the gas or liquid phases onto a solid surface is called ADSORPTION. 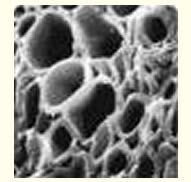 Pores in activated carbon vary in size and can be classified into three types: micropores which are less than 20 nm; mesopores which are 20-200 nm and macropores which are 200 nm and above. The meso and macropores are the tunnels that lead to the micropores. When used for air or water purification activated carbon works on the same principal as a sieve – polluted air or liquid is sent through a screen of activated carbon that absorbs toxic matter. AMONG THE CONTAMINANTS EFFECTIVELY REMOVED BY ACTIVATED CARBON are: arsenic, asbestos, benzene, atrazine, carbon tetrachloride, chlorine, chlorobenzene, chromium, copper, ethylbenzene, ethylene dibromide, heloketones, hexachlorobutadiene, hydrogen sulfide, iron, mercury, dichlorobenzene, radon, pentachlorophenol, styrene, toluene, xylenes, zinc and trichloroethylene. Why Coconut Shell AC is Superior vs. Other AC? Demand for Coconut Shell Activated Carbon is projected to grow with stricter environmental legislation and the rise in living standards requiring improved air and water purification. Activated carbon can be made from a wide variety of materials, among them wood, coal, sawdust, sugar cane bagasse and fruit kernels. However, activated carbon manufactured from coconut shells is considered superior to those obtained from other sources mainly because of its micropore structure - majority of the pores having a diameter of less than 2 nanometers! This makes it more effective for the adsorption of gas/vapour, for the removal of color and odor compounds and for solvent recovery. In addition to this, coconut shell activated carbon has high adsorption capabilities and low ash content. Its intrinsic hardness and abrasion resistance make coconut shell carbons ideal for use in gold recovery.